Is the future of VR NVIDIA, Sony and Apple? Ondrej Homola is co-founder and CEO of Lifeliqe, a platform company for the creation, sharing and deployment of interactive 3D objects into mobile, VR, AR and 3D printable media. Virtual reality is all the buzz nowadays. And why wouldn’t it be when analysts like Goldman Sachs make estimates that the industry is poised to surpass the TV market in annual revenue by 2025. 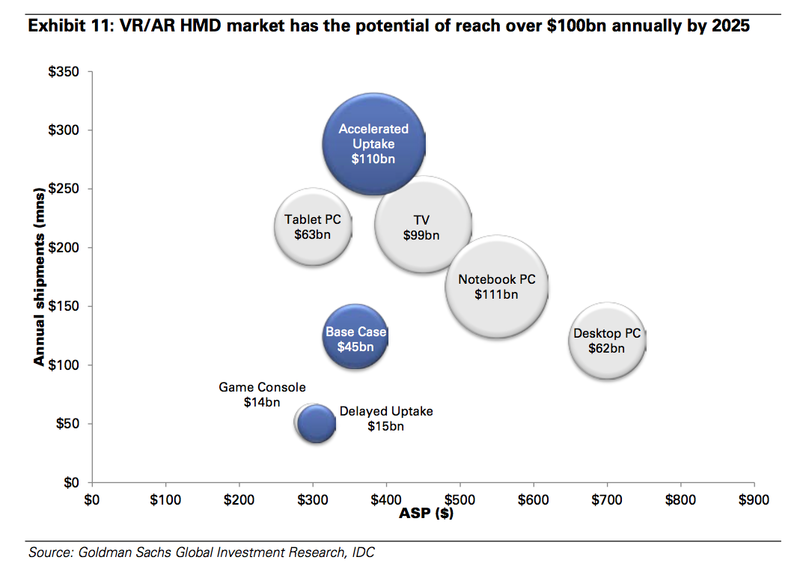 That would make virtual reality bigger than TV in less than 10 years. These estimates are so massive because the breakthrough technology has the ability to extend itself into so many markets — gaming, education, productivity and even adult entertainment. Estimates aside, one can often find the direction an industry is headed by following the money. In 2015 alone, virtual and augmented reality startups raised a total of $658 million in equity financing across 126 deals. Many of these companies backed include many virtual reality technologies you’ve already heard of, such as Leap Motion and Oculus. But can we believe all the hype? Will these companies be the leaders by the time Goldman Sachs’ estimate comes around? Having worked in the virtual reality space before it was a buzzword, I’ve seen a few things that lead me to believe there are three companies that will be as big, if not bigger, than some of the mainstream virtual reality names. NVIDIA is in the business of visual computing technology; its work started back in 1999 with the release of the GeForce (NV10). This consumer-level 3D hardware was ahead of its time with advanced video acceleration, motion compensation and hardware sub-picture alpha blending. It caught the eye of Microsoft and eventually became the graphics hardware for the Microsoft Xbox game console. Recently, my team bought a couple of NVIDIA development devices for VR and AR. The recent announcement about Pascal-based consumer PC graphics supporting VR caught our attention, as they appear to be pushing to create premium products in the space. One can often find the direction an industry is headed by following the money. The company’s brand is a natural fit in the virtual reality space and it won’t have a problem getting attention when it’s ready, but what is potentially the most compelling aspect is what they are doing with the NVIDIA GEFORCE NOW. This cloud gaming platform uses “cloud rendering” and “cloud computing” that will enable users to get high-end console-type graphics on their smartphones or even cardboard — at a reasonable cost. With the global cloud gaming market predicted to grow exponentially at a CAGR of more than 29 percent until 2020, NVIDIA is in a prime position to succeed with what I believe to be superior technology in the market. Sony is a bit hidden behind all the VR madness. But, current PlayStation users can easily upgrade their consoles and get a virtual reality 3D headset for only $399. The Sony PlayStation’s competitive price points have enabled it to compete with the Microsoft Xbox over the years, and now its VR headset gives consumers a more cost-friendly option compared to the $799 price point of the HTC Vive. Aside from the accessible price point, Sony has a closed ecosystem with a network of developers with whom they have been working for years. Sony PlayStation has a unique position to gain market share and be the clear winner of the virtual reality gaming ecosystem, similar to how Steve Jobs and Apple won early in mobile. The big questions are — will they be aggressive enough and are they able to move beyond the borders of gaming? Apple is notorious about being secretive; while it’s speculative, there are a lot of signs that it is developing a VR glove. The first point of evidence is a patent Apple filed in 2011 for a “High Tactility (Magic) Glove System.” This invention is directed to a glove system that includes an inner liner and an outer liner operative to transmit user inputs to the input mechanism of an electronic device. It was originally believed that Apple was creating a solution for consumers to use their iPhones in colder weather, but perhaps is was the start of something bigger. The second proof point is the company’s evolution of haptics, or the science of applying touch sensation and control to interaction with computer applications. Last year, Apple released a Taptic Engine and the technology is currently used with Apple Watch, MacBook and the latest iPhone devices. Apple haptic technology sends impulses into the fingertips, giving you the sensation of, for example, touching different materials or pushing a button, allowing users to know what actions are being performed and what you can expect to happen. Apple is getting serious in this area, hiring experts on haptics and revealing new technology such as a virtual touch desktop/keyboard based on its haptic technology. Sensing the direction already? I have tried HoloLens as well as augmented reality (AR) and mixed reality (MR) headsets. Those devices are great, but my first feedback for both was the same — the glove is missing. You need a glove for better interaction with virtual images. Visual hand recognition is not very accurate, further reinforcing the market potential for Apple. I’m convinced that Apple is working on Apple Glove, and I wouldn’t be surprised if they were also working on AR and MR devices, as well. The market opportunity is too big, and to stay competitive with major competitors like Samsung and Google, it’s hard to believe they wouldn’t launch something in this space in the next couple of years. If you think about it, they have no other option.